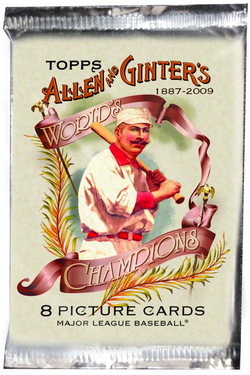 Topps' Allen and Ginter baseball has become one of the most popular baseball card products on the market, since reentering the brand reentered the hobby under the Topps Brand name in 2006. 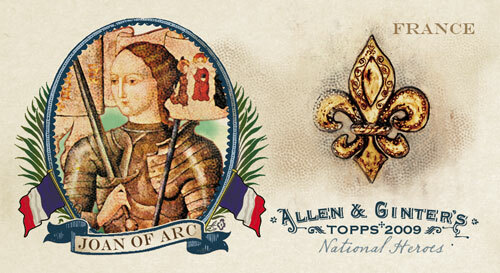 Topps Allen and Ginter is one of the rare products that seems to appeal to almost every type of baseball card collector. 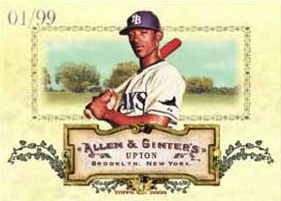 Topps recently pulled back the curtain on the 4th installment of the brand, 2009 Topps Allen and Ginter. This year's set has the potential to be the best one yet. 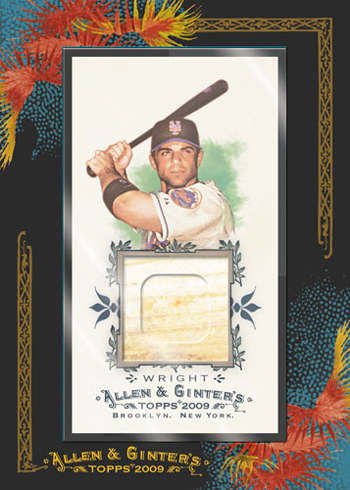 2009 Topps Allen and Ginter will feature a 350-card base set that includes 230 baseball veterans, 30 rookies, 25 historical figures and 15 world champions. 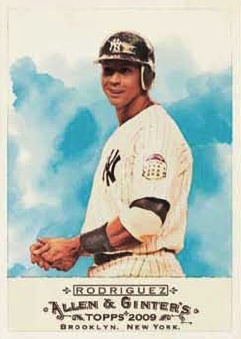 The set will feature 50 short printed cards. Among the many new faces debuting in this year's set are Vincent Van Gogh, General Custard, Ryan Lochte, Michael Phelps, and Brigham Young. 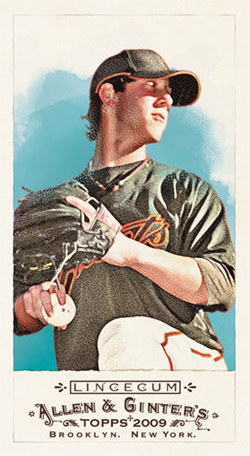 One of the more highly publicized inclusions in past Topps Allen and Ginter sets, DNA Hair Relics, is back for more in 2009. 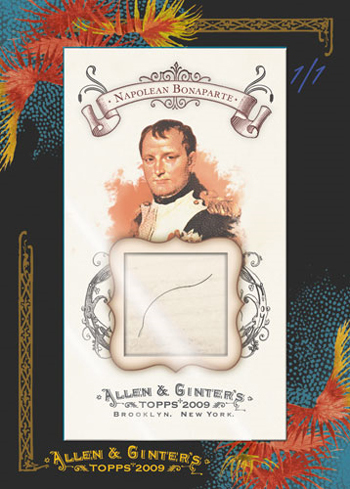 Collectors will have the opportunity to pull cards bearing the genetic footprints of famous historical figures such as Napoleon, Richard Nixon, Edgar Allan Poe, and even Beethoven. 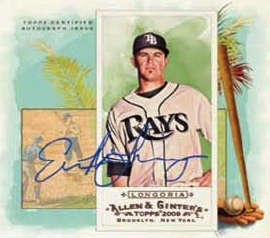 A brand new Ginter code for collectors to decipher will also find its way into the upcoming release. And it is here that the set gets a little strange. 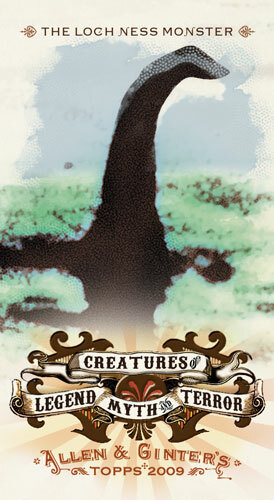 This year's code will be included in the Creatures of Legend insert set that includes the likes of mythical creatures such as The Loch Ness Monster and Bigfoot. Another strange addition to this year's set is the World's Biggest Hoaxes, Hoodwinks, and Bamboozles insert set. This strange insert set will feature scam artists Charles Ponzi and Bernie Madoff alongside Enron, The Runaway Bride, Enron, Cold Fusion, and The War of the Worlds. Maybe this would have been good for a laugh 5 years ago, but the unexpected Poor timing - to say the least.